COOL GAMBLER - LIM'S CRUISER (Sing.) (g. by Casino Prince). 4 wins. See below. Jack's Kiss (f. by Murtajill). Winner at 1450m in Aust. Lineker (Star Witness). 2 wins-1 at 2-at 1200m, 1400m, R1,412,425, to 2015-16, Turffontein Ready to Run Cup, 2d Kenilworth Skyy Vodka H., Turffontein Racing It's a Rush P., 3d Greyville Gatecrasher S., L, 4th Turffontein Dingaans H., Gr.2. Royal Nisha. 3 wins from 1450m to 2000m, R213,875, Clairwood All to Come H., Greyville Valvecraft H., 2d Scottsville Soccer 10 H., Rugby 5 H., 3d Greyville Racing It's a Rush H.
BATTLE MAIDEN (Goldkeeper). 6 wins. See above. CANNON BLAST (Cannon King). Champion 2YO in Zimbabwe in 1995-96. 11 wins-3 at 2-from 1200m to 1600m in South Africa and Zimbabwe, Borrowdale Champion Juvenile S., Gr.3, Ascot National Owners & Trainers Cup, L, Borrowdale Champagne S., L, 2d Ascot BP Guineas, Gr.3, Ascot Memorial Trophy H., L, Borrowdale Champion S., L, Guineas Trial S., L, 3d Borrowdale MOTA Free H., L, MOTA Juvenile S., L, 4th Borrowdale Rainbow Tourism S., Gr.3. Battle Cry (Goldkeeper). 5 wins-1 at 2-from 1000m to 1600m, R210,700, Z$109,875 in South Africa and Zimbabwe, 2d Borrowdale Champagne S., L.
Blast (Windrush). 4 wins to 1400m, R235,550, to 2015-16, 3d Fairview Ibhayi S., L, 4th Fairview Dahlia P., L.
Zhivago (Imperial Stride). 3 wins at 1600m, 1900m, R268,675, Greyville Hi-Tech Inks H., Motoring H., 2d Greyville Michaelmas H., L, Pinnacle S., Scottsville Soccer 1 H., 3d Scottsville KZN Summer Challenge Final 1950, Greyville Hughcor H.
QUINTUS (Quintipor). 7 wins from 2400m to 3200m in Zimbabwe, Borrowdale Bookmakers' Round the Course H., L, 2d Borrowdale Pat Fallon Memorial Cup, 4th Borrowdale Carlton Cup, L, Greyville Lonsdale Stirrup Cup, L.
CERISE CHERRY (Goldkeeper). 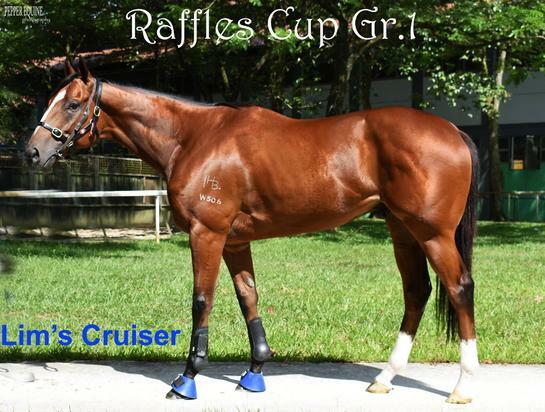 8 wins-1 at 2-from 1000m to 1650m, R1,182,550, HK$15,149,750, HKJC Premier Bowl H., HK-2, 2d Longines Hong Kong Sprint, Gr.1, Clairwood Premier's Champion S., Gr.1, Scottsville Gold Medallion S., Gr.1. KUSHKA (Goldkeeper). 7 wins-3 at 2-to 1400m, R675,675, Turffontein Protea S., Gr.2, Egoli Sprint H., Gr.3, Gosforth Park Graham Beck H., L, Turffontein Advance Plate, 2d Vaal Nijinsky H., L, Vaal Platinum Juvenile 1200 S. (c&g), L, 3d Turffontein Senor Santa H., Gr.3, Eagle S., L.
FLASHEE (Goldkeeper). 5 wins-1 at 2-from 1000m to 2000m in Zimbabwe, Zimbabwe Oaks, Gr.3, Borrowdale Fillies Classic S., L, Silver Slipper S. Producer. SUDDEN BURST (Pochard). 12 wins-3 at 2-from 1000m to 2700m in Zimbabwe, Ascot Natbrew Classic H., L, 2d Ascot BP Guineas, Gr.3. Race Record: 9 Starts 4-2-2 NZ$700, A$400, S$301,105. 4 wins from 1100m to 1600m, NZ$700, A$400, S$301,105, in 2016, Singapore TC EW Barker Trophy, Sgp-2, Gingerbread Man S., Super Gold S., Class 4 H., 2d Singapore TC Speed Baby S., Class 4 H., 3d Singapore TC Class 3 H.